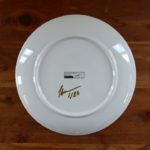 Can you tell me please if the plate is dishwasher safe? 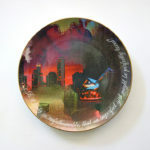 The image on the plate is a high quality image transfer, carefully applied by hand, and fired in a kiln. It’s meant for display and not for eating. The decals were printed with colors that might contain trace amounts of lead though they most likely meet FDA standards for lead according to the company that produces the decals. While you should be able to wash it with soap, I would not put it in the dishwasher. Thank you for your interest! are algorithm’s dreaming or they are performing an action? 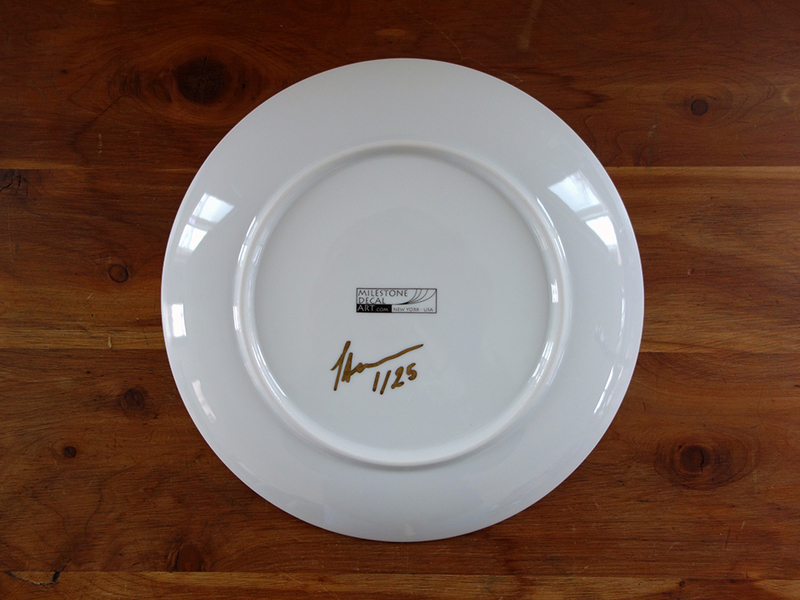 if algorithm’s perform an action, what is the role of the creator of this commemorative plate? what is capturing by an Algorithm? Good questions! While code can seem inhuman and computers behave in inhuman ways, behind every algorithm is a person. People’s likes, dislikes, misconceptions, and biases all get coded into the algorithms, so the programmer plays a a very important role. 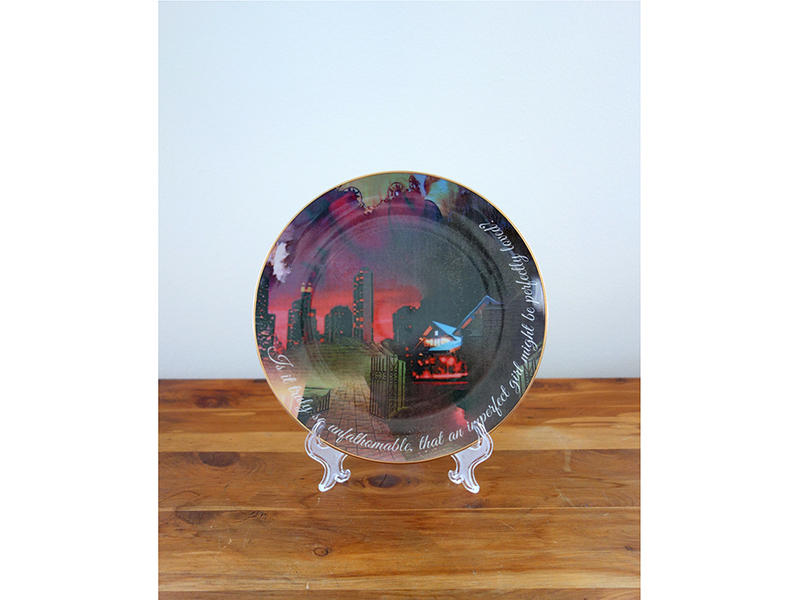 For this project, I wrote an “algorithm” (a very specific set of steps) to produce these plates that uses other very popular algorithms like Photoshop’s panorama feature, for example. In my “algorithm”, I do some curation of the results produced by the software, and, based on the patterns I see, I also sometimes tune the input in later iterations of the project. In other projects, I write all my own code, and I like to think of the code/algorithm as my artistic medium where randomness is my palette. Like mixing all shades of grey paint from black and white, there is a whole range in between pure randomness and pure determinism. The middle of that range…where control is shared between the artist and the computer, where it becomes more of a team effort between the artist and the technology…tends to be where humans find the most meaning. Thank you for your interest! Also, in this case I’m commemorating (capturing) the results of an algorithm at a single moment in time. For example, every time I add new imagery to my pool, the hybrid images produced will be different. The Kindle Most Popular Highlights for a given book are also not constant because people are always highlighting different things on their Kindles, though it’s interesting to see which quotes persist over time. The outcome of my process at a certain moment will never be exactly the same as at another moment. Again, thanks for your interest! it makes me think about personality. Also this space, the randomness and determination of things. like randomly picking your project to question out of the other. And determined to put forward two-three related questions. The shape decided where the print out does not seem random. I am referring to the plate. Does the Photoshop leave any space for errors while stitching? Do Algoritham’s while writing work with intuition, spontaneousness for you? do the hybrid images deal with erasure? will they have a heightened sense of memory, emotions, something which is illusive enough to seem real? if so, let us suppose i am falling, and i have a certain sense of how much i am falling, to portray this, a certain programming steps could be written. Would you be in a position to answer about this fall? or through the process of algorithm, communicate something on what i said? this is an image drawn by me, i responded to whatever i read so far, the two mail replies, the process of making, the image of the plate and my internal set of instructions led me to draw this out. here the site is E bay. I am wondering what if people with mental disabilities, illness, deal with drawing on paper, their state of mind in comparison to having the cognitive ability to write a set of instructions ( not sure if it is that simple ) and for them to run that code and create their own work which explores the relationship of human and technology. And how do we distinguish these two acts, the one to draw on paper and the other to create via Coding? I’ve always found writing and using algorithms to be intuitive, but that could be because I have such an intense relationship with computers and am trained as a computer scientist. The images are definitely not placed arbitrarily. Photoshop is looking for where the images match up. Romance novel covers mostly have a very similar dreamy look, and Photoshop is attempting to put them together into a scene. Do you think algorithms have personality? I do think these plates deal with erasure, elusiveness, and memory. Many internet algorithms display content based on user data that changes constantly…what we encounter on the internet changes moment by moment. When I look at the Kindle Most Popular Highlights for a certain book one day, I see a list of highlighted passages that convey to me a certain meaning and capture a certain state of the world. When I look at the Popular Highlights for the same book a few months later, the selections can change a lot, and the way I understand the people who read the book is different. If instead of making the plates I showed the results of my process in real-time as a software-based artwork, so many of these types of moments/understandings would get lost. Thank you for your drawing, and another interesting question! I think you can consider each artistic medium a technology, and every technology structures the way you think. Painting with oil means you can look at the world and pay attention to it in a different order than if you were painting a watercolor because oil is opaque and watercolor is transparent. Working with any piece of software or machine is similar…it forces you to perceive, think, and solve problems differently. What is your internal set of instructions? i feel anything, including Algorithm have a personality of their own independent of its creator as it is an extension of the creator. 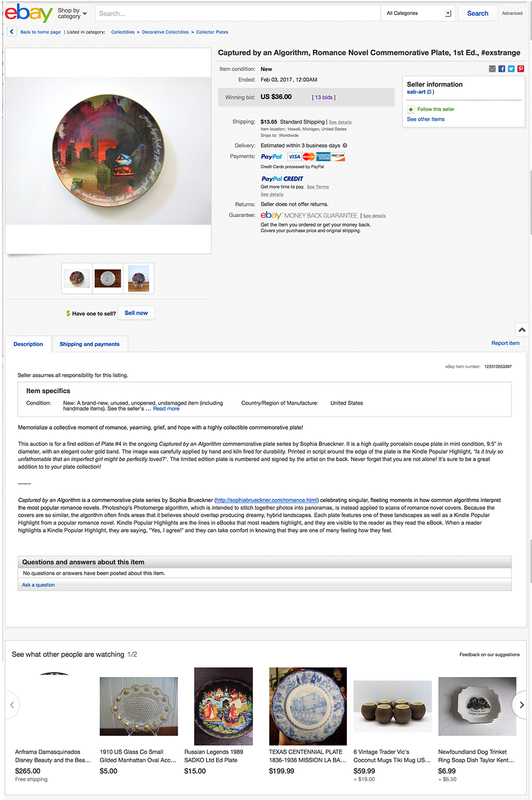 like realising or viewing the algorithm through the painting it has created on the plate. I feel if you can see something through something ( i.e. – the code and coder through the object ), each being, process has some form of identity. What interests me, is that it will perform a function, and that is beautiful because it will produce in an endless loop, every time when asked to. And its ability to, like how you write – the net changing every moment, but how do we know this, the measuring device, the code allows us to read the changes, experience the changes. I really like them! 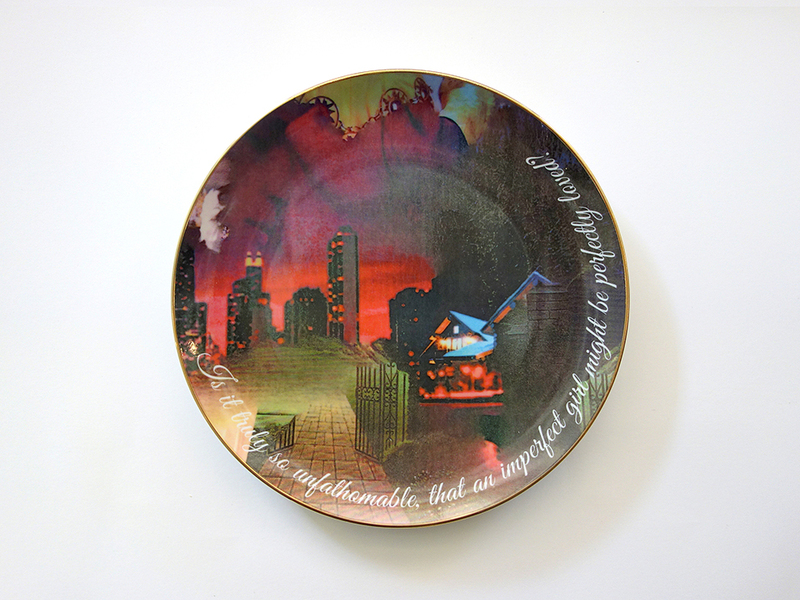 Do you work this way often or were you inspired by the plate specifically? This is true…this makes me think about how the algorithm producing all those changes is biased by the programmer and my algorithm for capturing/observing all those changes is biased by me. Algorithms aren’t neutral, and they don’t always reveal the truth or a single truth. Sophia Brueckner is an artist, designer, and engineer. At Google, she developed products used by tens of millions. At RISD and the MIT Media Lab, she combined the understanding that interfaces structure thought processes with ideas from cognitive behavioral therapy to build devices for mental health. Since 2011, she has taught an internationally renowned class on sci-fi prototyping and the ethics of design/invention. She recently joined the University of Michigan as an assistant professor. Her ongoing objective is to combine her background in design and engineering with the perspective of an artist to create new technologies in the service of mental well-being. 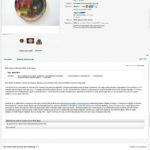 Captured by an Algorithm is a commemorative plate series (http://sophiabrueckner.com/romance.html) celebrating singular, fleeting moments in how common algorithms interpret the most popular romance novels. Photoshop’s Photomerge algorithm, which is intended to stitch together photos into panoramas, is instead applied to scans of romance novel covers. Because the covers are so similar, the algorithm often finds areas that it believes should overlap producing dreamy, hybrid landscapes. 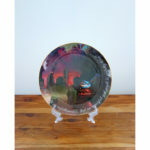 Each plate features one of these landscapes as well as a Kindle Popular Highlight from a popular romance novel. Kindle Popular Highlights are the lines in eBooks that most readers highlight, and they are visible to the reader as they read the eBook. When a reader highlights a Kindle Popular Highlight, they are saying, “Yes, I agree!” and they can take comfort in knowing that they are one of many feeling how they feel.